The Bus Creator block combines a set of signals into a bus. To bundle a group of signals with a Bus Creator block, set the block parameter Number of inputs to the number of signals in the group. The block displays the number of inport ports that you specify. Connect to the resulting input ports the signals that you want to group. You can connect any type of signal to the inputs, including other bus signals. To access individual signals in a bus signal, connect the output port of the block to a Bus Selector block port. The signals in the bus are ordered from the top input port to the bottom input port. See Port Location After Rotating or Flipping for a description of the port order for various block orientations. To rearrange the signals in the output bus signal, use buttons such as Up or Down buttons. 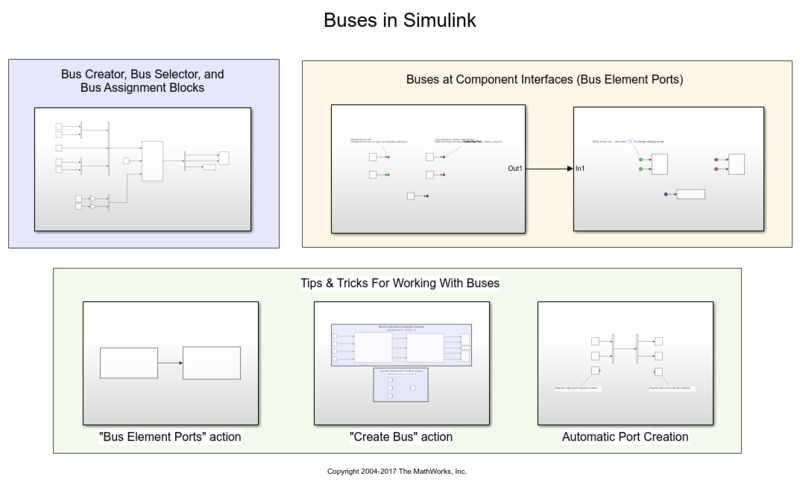 Simulink® hides the name of a Bus Creator block when you copy it from the Simulink library to a model. 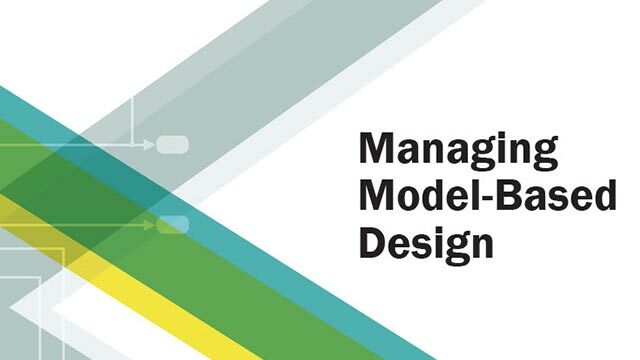 Input signals can have real or complex values of any data type supported by Simulink, including bus objects, arrays of buses, fixed-point, and enumerated data types. For details about data types, see Simulink, Data Types Supported by Simulink. Bus that combines the input signals. Number of inputs, not fewer than two. Increasing the number of connected ports adds empty ports below the connected ports. Before you simulate the model, make sure that an input signal is connected to each input port. List of input signals to combine into a bus signal. An arrow next to a signal name indicates that the input signal is a bus. To display the signals in an input bus, click the arrow. For information about working with the signals in the list, see Bus Creation Using Bus Creator Blocks. Search term used to filter a long list of input signals. Do not enclose the search term in quotation marks. The filter does a partial string search. To access filtering options, including using a regular expression to specify the search term, click the button to the right of the Filter by name edit box. Enable the use of MATLAB® regular expressions for filtering signal names. For example, entering t$ in the Filter by name edit box displays all signals whose names end with a lowercase t (and their immediate parents). For details, see Regular Expressions (MATLAB). To access this parameter, click the button to the right of the Filter by name edit box. Enable the flat list format that uses dot notation to reflect the hierarchy of bus signals based on the search text in the Filter by name edit box. By default, a tree list displays the filtered signals. Data type of the output bus signal. Determine whether you want the Bus Creator block to output a virtual or nonvirtual bus. For a virtual bus, use the Output data type parameter default (Inherit: auto) or set the parameter to specify a bus object using Bus: <object name>. For a nonvirtual bus, set the Output data type parameter to specify a bus object using Bus: <object name> and click Output as nonvirtual bus. If you select 'Bus: <object name>', specify a bus object in the edit box. The bus object must be in the base workspace when you perform an update diagram or simulate the model. To define a bus object using the Bus Editor, click Show data type assistant and then click Edit. For details, see Create Bus Objects with the Bus Editor. If you select '<data type expression>', specify an expression that evaluates to a data type. Do not specify a bus object as the expression. Optional check that input signal names match signal names in the Bus Creator Block Parameters dialog box. The Require input signal names to match signals above parameter might be removed in a future release. To enforce strong data typing, consider using the Override bus signal names from inputs parameter. If you select Override bus signal names from inputs, Simulink software ignores the Require input signal names to match signals above setting. If you change the Number of inputs programmatically, this parameter reverts to 'off'. Name for the currently selected input signal. See Signal Names and Labels for signal name guidelines. To display this parameter, enable the Require input signal names to match signals above parameter. By default, the Bus Creator block overrides bus signal names from inputs. Avoids having to enter a signal name multiple times: in the bus object and in the model. Entering the name multiple times can accidentally create signal name mismatches. Supports the array of buses requirement to have consistent signal names across array elements. Alternatively, you can enforce strong data typing by checking that input signal names match the bus object element names. Keep the Override bus signal names from inputs check box selected. Set the Element name mismatch parameter to error. To display this parameter, set the Output data type parameter to a bus object. Nonvirtual bus output from the Bus Creator block. All signals in a nonvirtual bus must have the same sample time, even if the elements of the associated bus object specify inherited sample times. Any bus operation resulting in a nonvirtual bus that violates this requirement generates an error. To change the sample time of a signal or bus that has a different sample time than the other nonvirtual bus input signals, use a Rate Transition block. For details, see Specify Bus Signal Sample Times. To generate code that uses a C structure to define the structure of the bus signal output by this block, enable this parameter. This block has a single, default HDL architecture. See Bus Creator.